The design was inspired by the CAS(E) This Sketch Challenge, #156. Have a gander at their site when you get done here, okay? I made this card using a panel of Canson 90lb Cold-Pressed Watercolor Paper (that I picked up at Michael’s) for the card front. My first step was to stamp the deer in Crumb Cake in the middle of the panel. Then I stamped the image again on a sticky note (with the mama’s head/ears in the sticky part!). And then – yes, brace yourself! – I fussy cut them out of the sticky note. Including the spaces between their legs. Yes. It was a bit tedious…. 😉 But then I had a mask! I stuck the mask over the deer and began to layer on the foliage. The trees in the background are one of the images from the In The Meadow set – I inked the stamp with Mossy Meadow and stamped it off 3 times on scrap paper before I stamped each image onto the card front. This is all right over the top of the masked-off deer! I also used my Blender Pen – with no ink – to kind of soften the trees in the background. All it took was to kind of gently go over the images with the clean Blender Pen. I think it makes it fade into the background even more – and evokes a misty morning. For the foreground foliage, I used Mossy Meadow again and just did a series of stamps – full strength ink – stamped again once or twice without re-inking…until I got them kind of surrounded by bushes. Then I pulled the mask off the deer. I colored them in with my Blender Pen. Mama is done in Soft Suede – and Smoky Slate. Deer where I come from are really more grayish than brown – so I wanted to highlight that fact with the mom. Baby is all Soft Suede. I tried to get some highlighting on their bodies. I have to tell you – this watercolor paper is wonderful to work with! No pilling or pulling or anything. Very nice stuff! I wanted to “finish” the scene a little, so I used my Night of Navy and Mossy Meadow sponges to added a little color to the sky and around the bottom edges. My sponges – SU! sponges cut into about 6 wedges each – are kept in a baggie. Not my most organized way to do business (anyone have a different idea for storing them?) – but they tend to keep a little moisture in them. So…when I need just a brush of color, I can usually just pull one out and use it without putting any more ink on it. That’s what I did on this card! I SNAILd the focal panel to an Early Espresso card stock mat. Then I wrapped a piece of 1 1/4″ Burlap Ribbon around the panel and secured it in the back with scotch tape. For the sentiment banner, I stamped the In the Meadow sentiment in Mossy Meadow on a piece of Very Vanilla – then I cut the ends with my Washi Label punch. The mat is a piece of Mossy Meadow – cut with the Washi Label punch – and shorter than the sentiment. I layered them together with SNAIL, and then used Glue Dots on the back to loop some Gold Metallic thread. Then I used a combo of Stampin’ Dimensionals and Multi-Purpose Liquid Glue to adhere it to the Burlap Ribbon. And the card front was done! So then I SNAILd the inside into my Blackberry Bliss card base, and popped the front on with Stampin’ Dimensionals – and the card was done! I pulled out a Very Vanilla Medium Envelope and stamped In the Meadow foliage and obviously-not-real-Smoky-Slate-and-Pool-Party bugs on the front. I didn’t make a liner this time – I didn’t have paper with me here that seemed like it worked with the card – so I didn’t even try to fake it! Et Voila! My first attempt at using the In The Meadow stamp set. Hope you like it! Tomorrow is the Happy Stamper’s Weekly Blog Hop. I’ve got another birthday card to share – this time at the….other….end of the age spectrum! 😉 Hope you’ll come back to see what I’ve got up my sleeve and to check out all the offerings from the Happy Stampers ladies. We’ll be live at 7am Eastern! 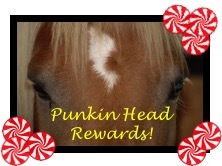 All orders of $25 or greater (before shipping and taxes) placed through my online store from now through the 31 January will earn double Punkin Head Reward Points!! Let me know if you have any questions. Check out all the details here! Happy shopping! Use this host code when you order and receive a free gift from me! But, if your order is over $150, please don’t use this code (you’ll miss out on your own Stampin’ Rewards if you use it) but you’ll still get the free gift. The free gift for Jan is your choice of any item valued up to $8.00 in the brand new 2015-16 Annual Catalog or the 2015 Occasions Catalog. WEEKLY DEALS FOR 26 Jan – 1 Feb 16!! Click here to see the Weekly Deals from Stampin’ Up! in my online store. The Weekly Deals are only while supplies last and only available at these great prices through 1 Feb! My, Mary. No worries about throwing this card in the ring…it is SO good. From the design to the lovely sentiment. It is wonderful. And guess what? I would choose it to send to you , first thing! Oh, I love deer. I just got this set and feel the same way; but, you sure nailed it!!! I would definitely set this in a picture frame for my desk. LOVE, LOVE and LOVE!!! I love the close up picture. The baby deer looks like it is smelling the flowers or it is going to chomp them for breakfast! =) So cute! Oh, what a wonderful scene you created! Great take on the sketch! Great card, once again! Wow, you are on fire with your creativity! I don’t have this stamp set yet! Will be ordering this next month. your card is so awesome! I I thought of a misty morning when I saw your card. I’m going to try and make one similar to yours. I wasn’t sure I wanted it till I saw your card. Deep down I knew I wanted this set. thanks for the excuse! This is the best I’ve seen using this set–beautiful!